A storm front charged across coastal Massachusetts this afternoon, May 31st, preceded by dark clouds and gusty winds, and dropping temperatures more than 20 degrees in five minutes. 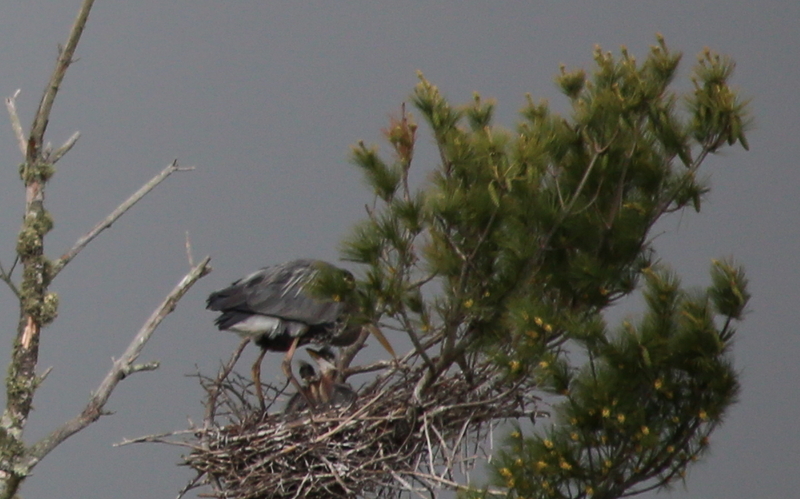 The Turtle Journal’s Don Lewis & Sue Wieber Nourse were caught by the storm while we visited the SouthCoast great blue heron rookery to document the birth of hatchlings. 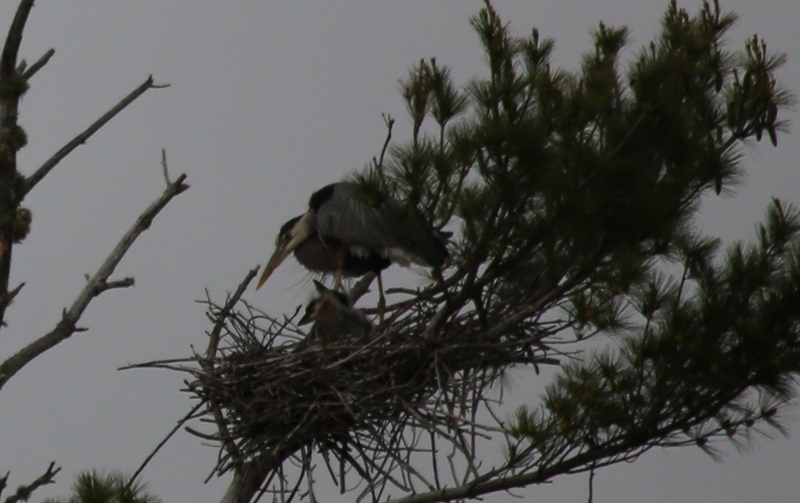 Behavior by adult birds on both active heron nests over the past few days strongly indicated that eggs had hatched, but the babies were too deeply set within the nests to confirm their birth. 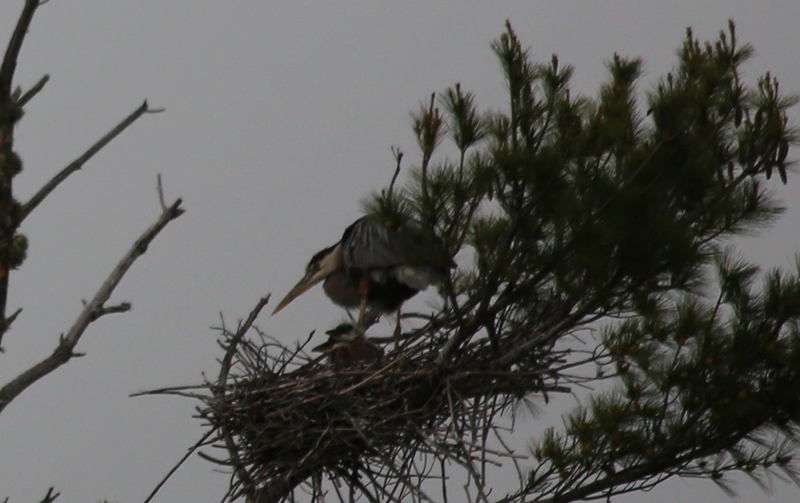 This nest had been completed destroyed by hurricane force blizzards in January and February. 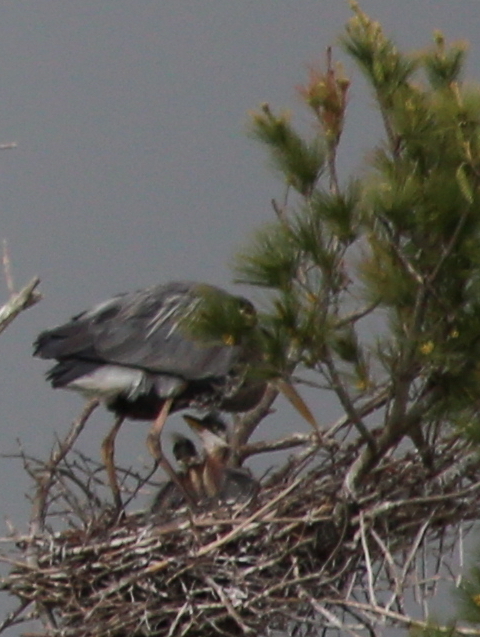 It and two other nests within the rookery were rebuilt, two by herons and one by a pair of ospreys. 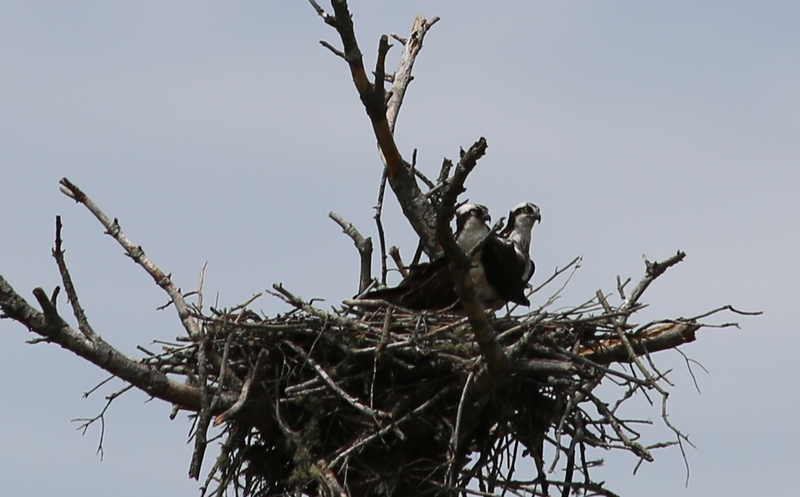 For the full story of the rebuilding process, see Rebuilding Destroyed Nest and Loving Bonds. 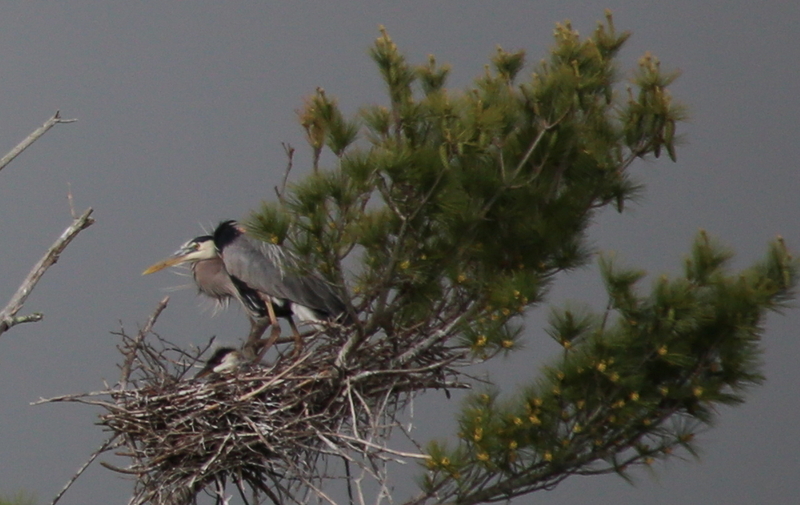 While we had not been able to confirm births on earlier visits, we got lucky today with the storm. 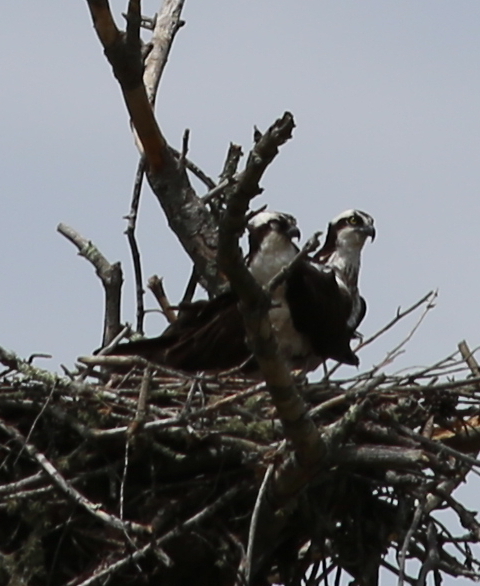 High winds swayed the northernmost nest and riled babies and mother just enough for us to get a peek of the hatchlings with binoculars and telephoto lens. 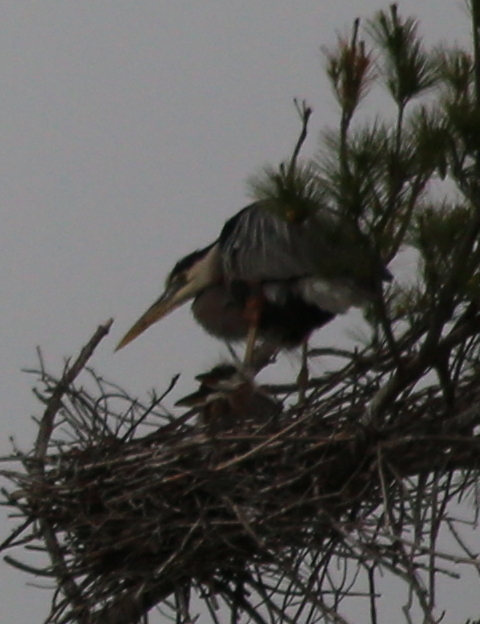 Two beautiful great blue heron babies popped up while momma tried to keep them secured within the swaying nest. 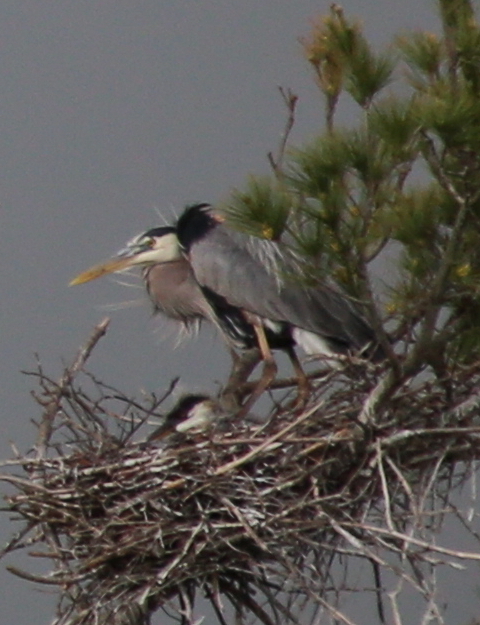 The nearby second heron nest likely also contains hatchlings, but the nest is much deeper and it will take a few more days of growth before hatchling heads are visible. This morning the Turtle Journal team discovered the first diamondback terrapin nester of the 2015 season on an isolated and protected Massachusetts SouthCoast beach. 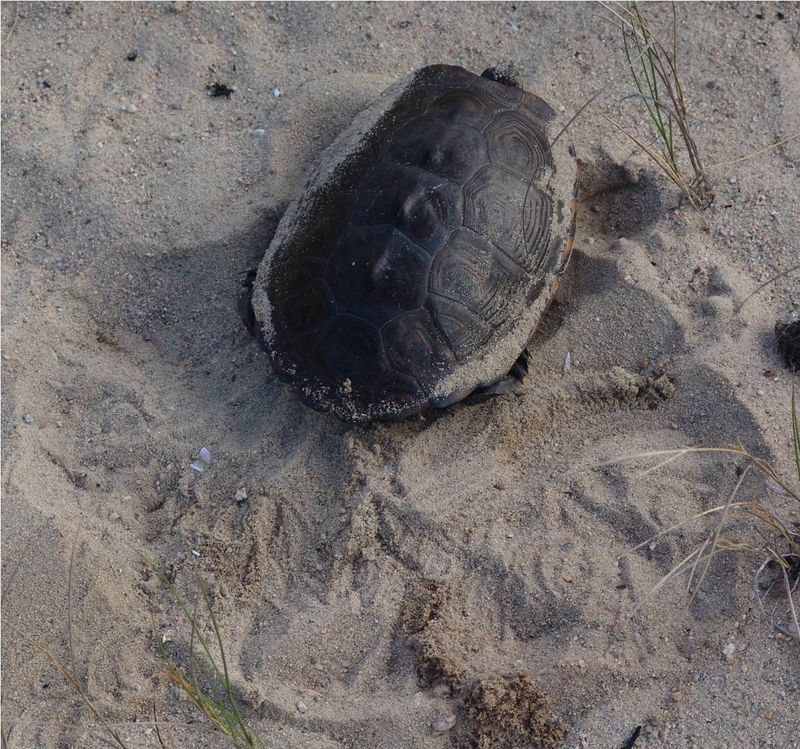 With the first steamy morning of the year on the SouthCoast, Sue Wieber Nourse, Don Lewis and Rufus the Turtle Dog patrolled a sampling of SouthCoast nesting sites in anticipation of finding the year’s first nester. We were not disappointed at our first beach. At least two female terrapins had come ashore on the morning high tide that coincided with daybreak. 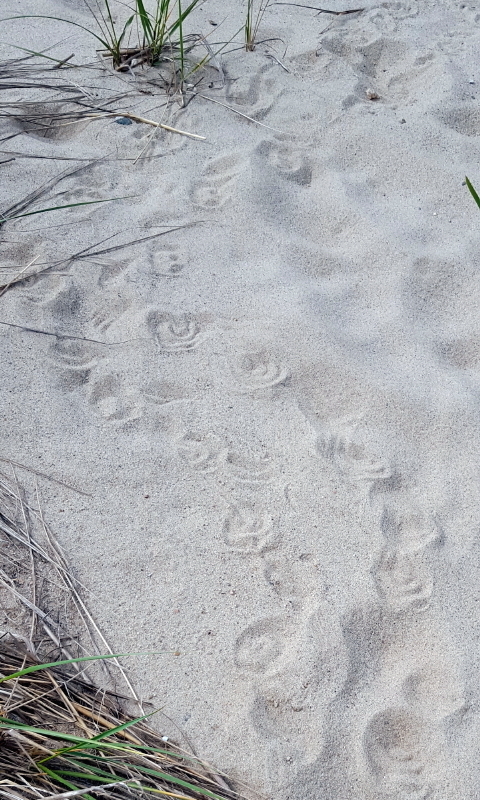 We followed one set of tracks as the turtle meandered along the beach, stopping every fifty feet or so to dip a false (test) nest. We tracked this female as she crawled into the salt marsh without depositing her eggs. Following a second set of tracks, which also zigzagged up and down the beach, we encountered our first nester of 2015, as she rested atop her completed nest. 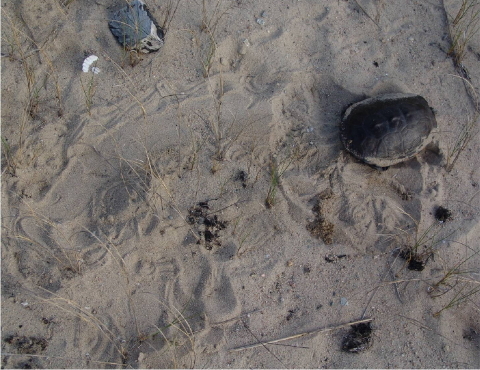 As though posing for scientific documentation, she illustrated precisely what a pristine terrapin beach nest looks like. A perfect way to indoctrinate a new set of terrapin researchers for the 2015 season. 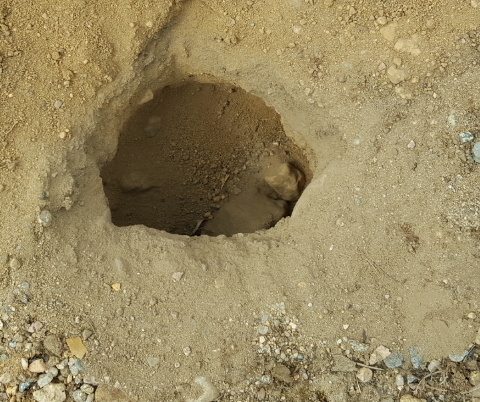 After searching the remainder of the beach, we visited a second site in a developed residential community. 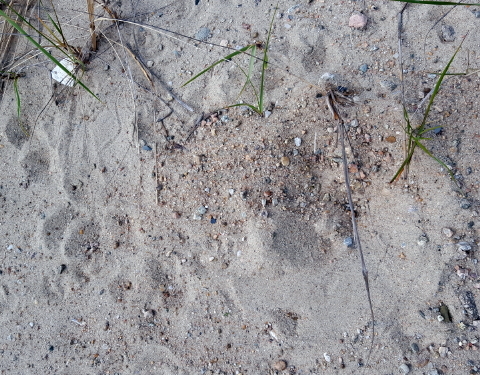 Here, too, a female terrapin had come ashore on the morning tide, dug a couple of false (test) nests, and then returned to the nearby creek without depositing her eggs. The diamondback terrapin nesting season has officially begun on the SouthCoast of Massachusetts. This morning, 29 May, the Turtle Journal team captured a gravid female diamondback terrapin with fully developed eggs in the main Sippican Harbor mating aggregation. 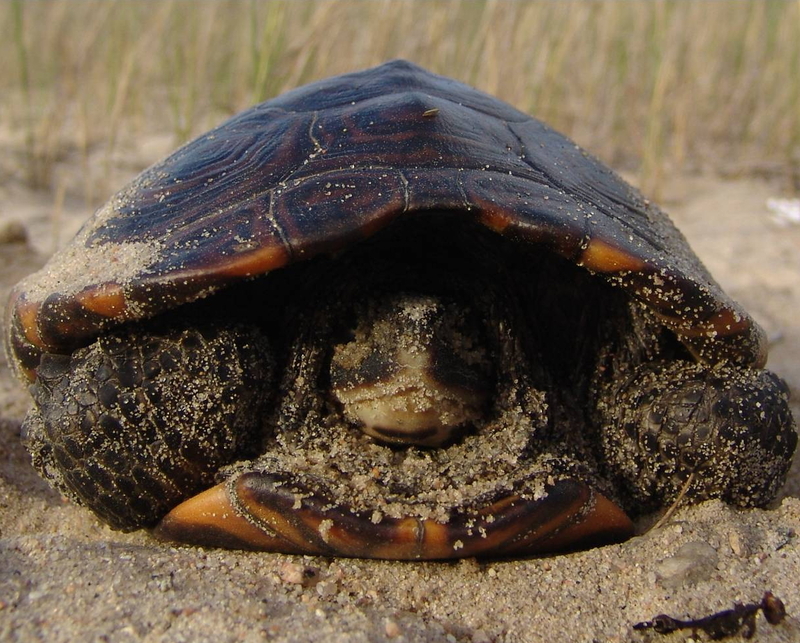 Her condition portends an imminent beginning to the diamondback terrapin nesting season on the SouthCoast of Massachusetts. 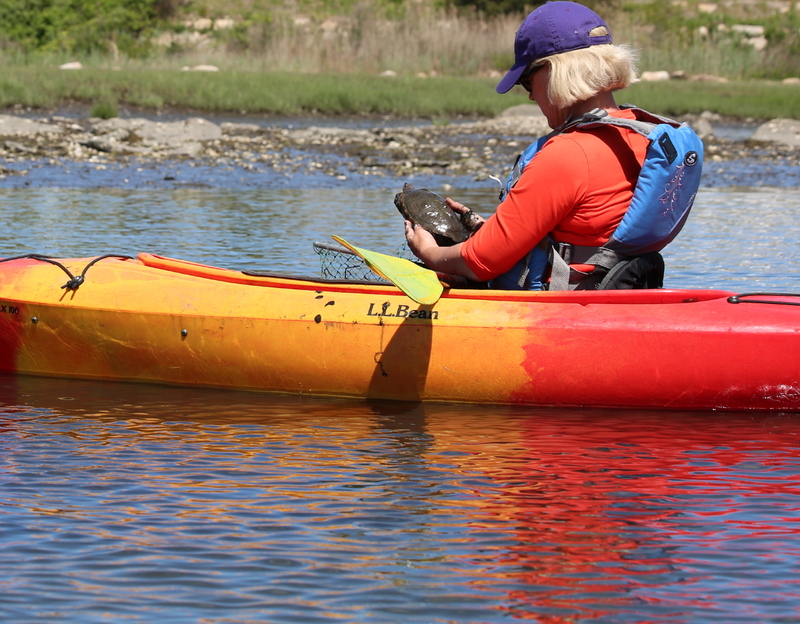 At low tide this morning we launched kayaks into the principal mating aggregations in Sippican Harbor, an estuary of Buzzards Bay. 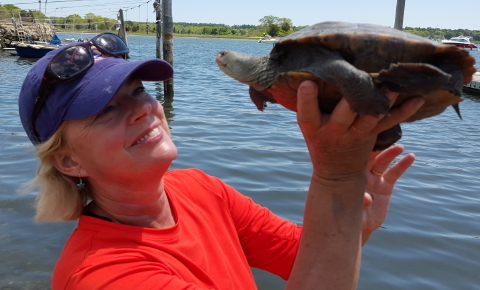 The first turtle Sue Wieber Nourse netted proved a unique lass: Terrapin #265. We have been following this lady for ten years, since her first capture on May 30th, 2005 when she was only ~ nine years old. 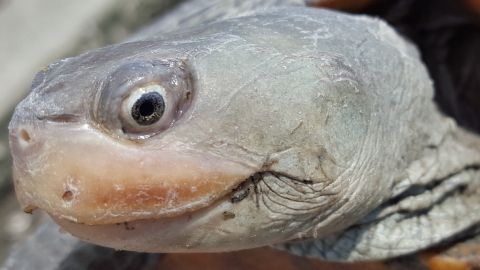 She’s a special terrapin because of her unmarked, bluish skin which gives the appearance of a snakehead; very un-terrapin like, but easy to distinguish from all others. The most important finding this morning was that Terrapin #265 was palpably gravid with fully developed eggs which had dropped about midway down the canal. We estimate she’s still a few days shy of nesting, especially since #265 remains in the mating aggregation about 2.5 miles north of her nesting site. 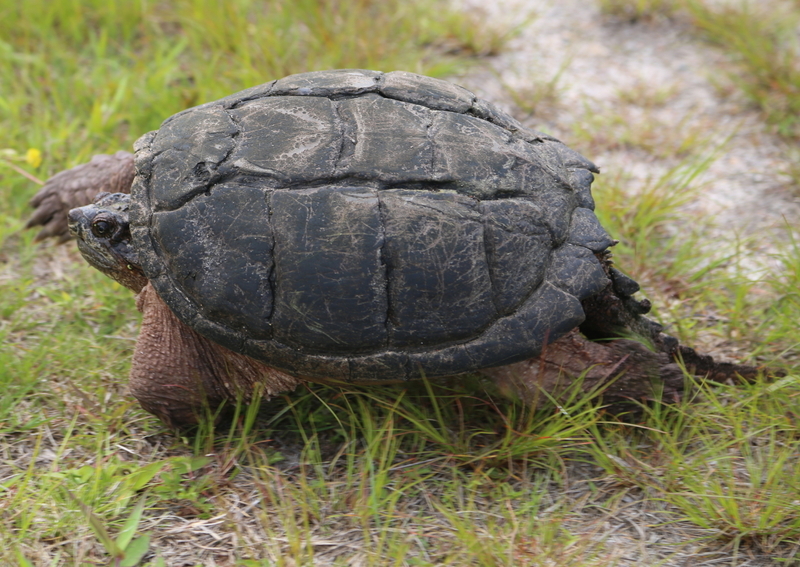 When we first saw #265 in 2005, she weighed 1133 grams and measured 18.7 centimeters straight-line carapace length. 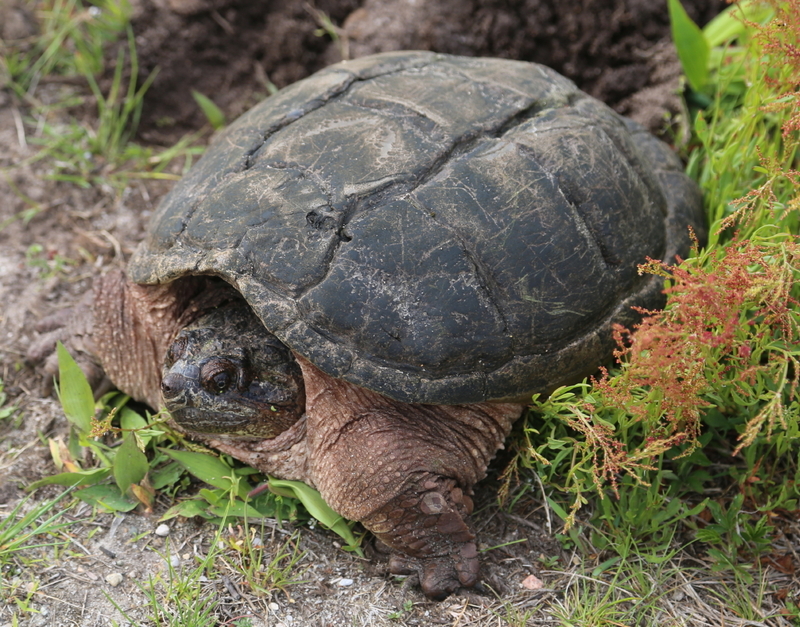 Today, a decade later, she weighs 1435 grams and measures 20.1 centimeters carapace length. Last May 2014, she had a clouded left eye which seemed completely clear this morning. 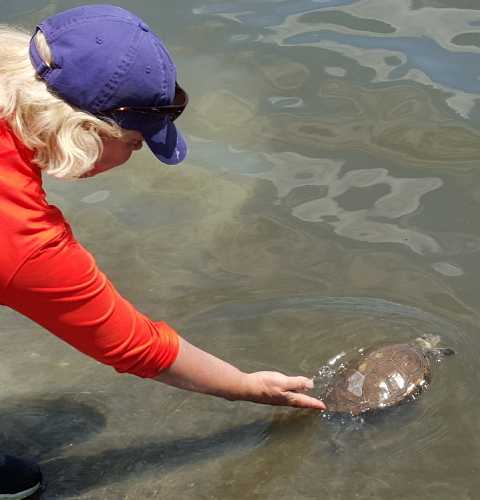 Because of her “condition,” we released her immediately after examination, so that she could “get on with it.” We hope to see her soon at her nesting site. 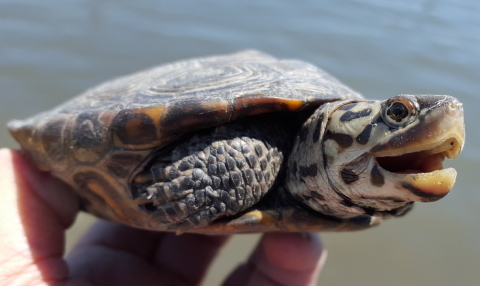 In addition to Terrapin #265, Sue netted other terrapins whom we had not seen in adulthood. 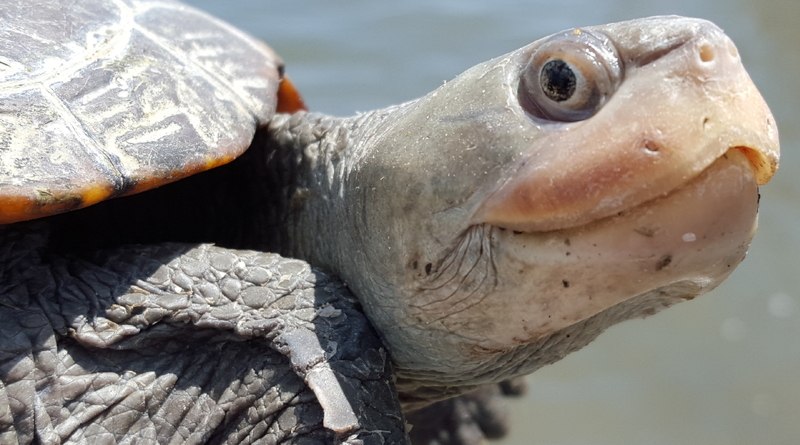 Both of these turtles would have been the results of the intensive Buzzards Bay conservation effort for terrapin nests, eggs and hatchlings begun by the Turtle Journal team in 2003. 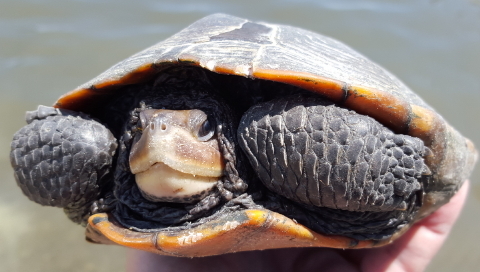 Female Terrapin #115 proved ~ 9 years old from the 2005 hatchling cohort. She has now reached maturity and should be nesting in the next few weeks. She did not show palpable signs of gravidity this morning. Male Terrapin #116 came from the 2006 hatchling cohort and, as is the case with male terrapins, has been mature for several years. 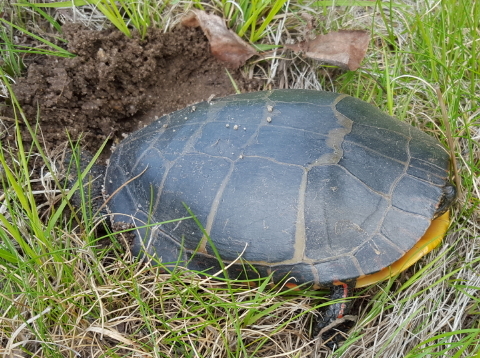 With bright sunshine and rising temperatures, Tuesday afternoon, May 26th, proved extremely active for painted turtle nesting on the SouthCoast of Massachusetts. 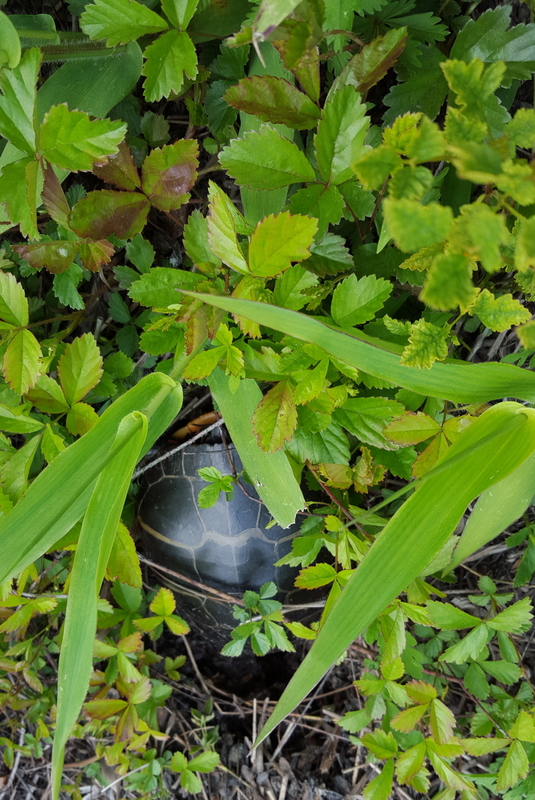 The Turtle Journal team had found the first SouthCoast nesting turtle, a snapper, in the morning, and we had also observed several painted turtle tracks, but only false nests. 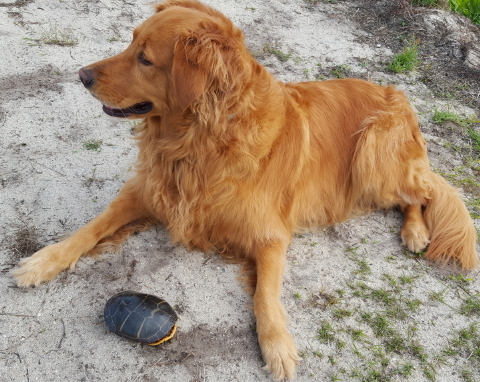 With more favorable conditions, Rufus, the famous turtle dog, found several nesting painted turtles Tuesday afternoon. No matter how camouflaged the turtles might be, like the one pictured above hiding under dense vegetation on a steep bog bank, Rufus sniffs them out. 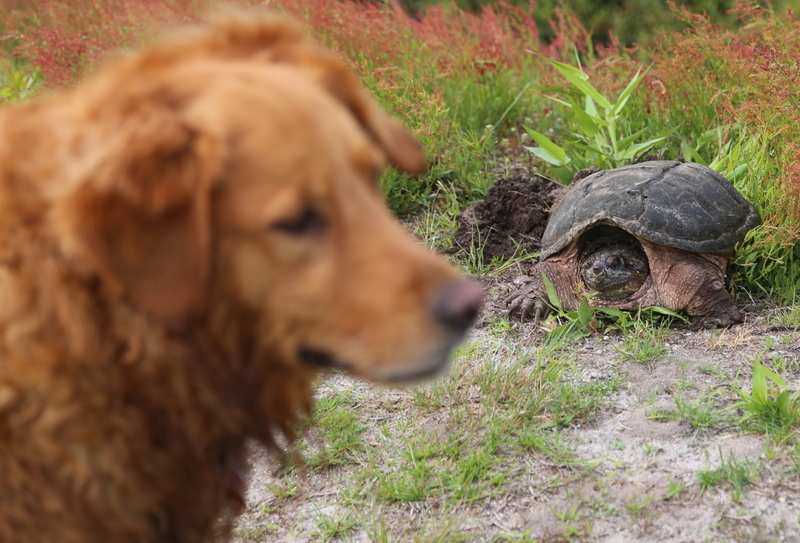 After the turtle is found, Rufus remains motionless until her colleagues respond. Rufus has trained the humans very well. As she patrolled the upland pathways surrounding the cranberry bog, Rufus found another nesting painted turtle. As documented in the photograph above, she patiently stands a comfortable distance from the nesting turtle until she gains our attention. Unlike diamondback terrapins that avoid grass for nesting, painted turtles prefer grassy spots to dig their nests. 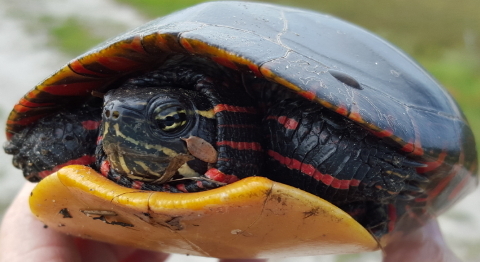 Unlike terrapins and snappers, painted turtle nests tend to be fairly shallow, only a couple of inches below the surface. 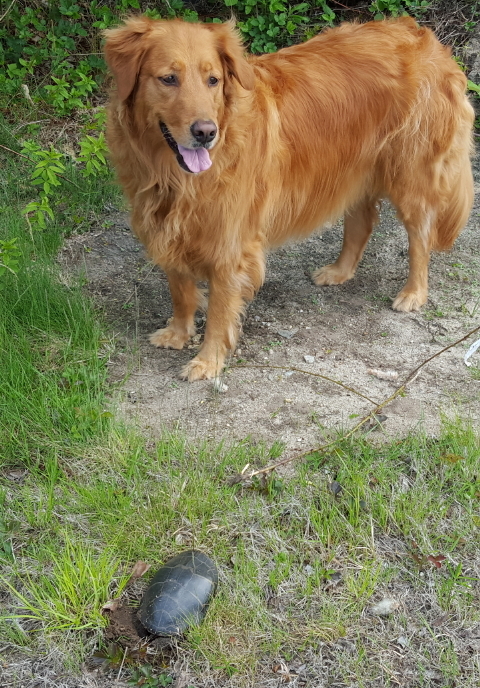 Rufus discovered an abandoned nest containing seven perfect painted turtle eggs where the mother had apparently been disturbed before covering the nest. 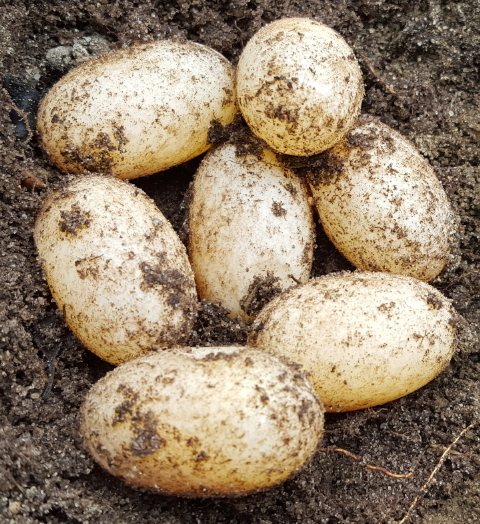 Thanks to her skills, these eggs (and the future hatchlings they promise) were saved from certain depredation. With snappers this morning and painted turtles this afternoon, the nesting season is now in full swing on the SouthCoast of Massachusetts. Tuesday morning, May 26th, dawned with cloudy skies powered by a brisk westerly breeze. For the last couple of days, the Turtle Journal team observed movement of snappers and painted turtles in the bog channels of the SouthCoast, preparatory to nesting. 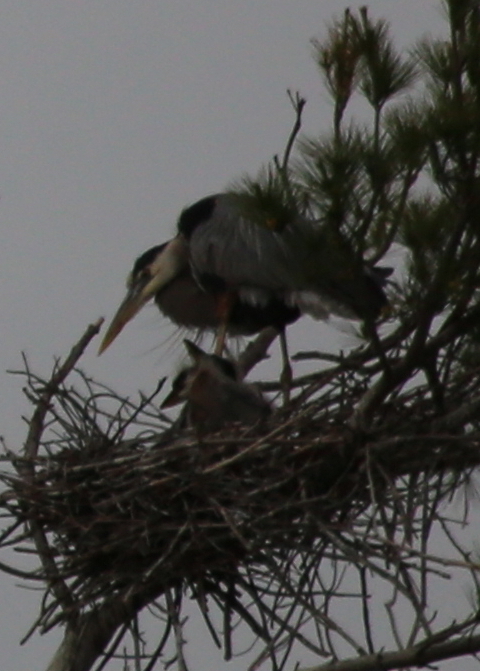 We expected to see our first nesters with daybreak this morning and we were not disappointed. The Turtle Journal team with Rufus the Turtle Dog and Sue Wieber Nourse in the lead discovered the first SouthCoast nester of the 2015 season. Rufus the Turtle Dog and Sue Wieber Nourse led the search that discovered the first SouthCoast nester of the 2015 season. 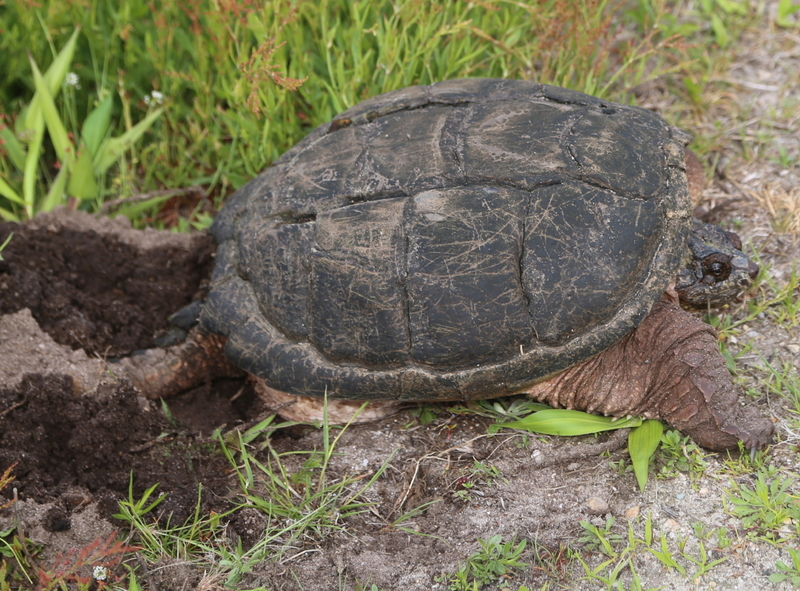 A young female snapper, perhaps ten years old, industriously excavated her nest at the crest of a cranberry bog bank. She anchored her tail into the muddy soil to give her sound leverage and then scooped vigorously with her rear legs to shape a deep egg chamber to deposit her eggs where they will incubate for the next two to three months. Rufus, remembering previous close encounters with these living dinosaurs, practiced studied indifference after first alerting us to the nesting snapper. Clearly, she saw the better part of valor in allowing the humans to approach the feisty snapper. 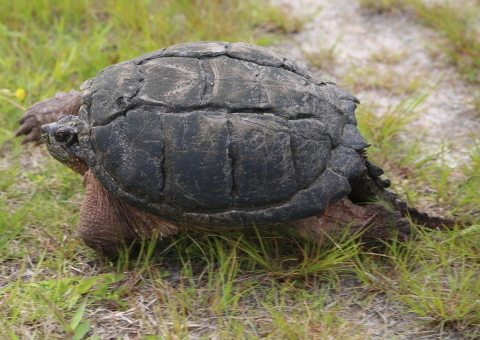 Once done with her nest, the young snapper chugged like a Sherman tank across the narrow pathway and plunged into the reservoir with a might belly-flop. KA-SPLASH as water erupted like an exploding volcano. 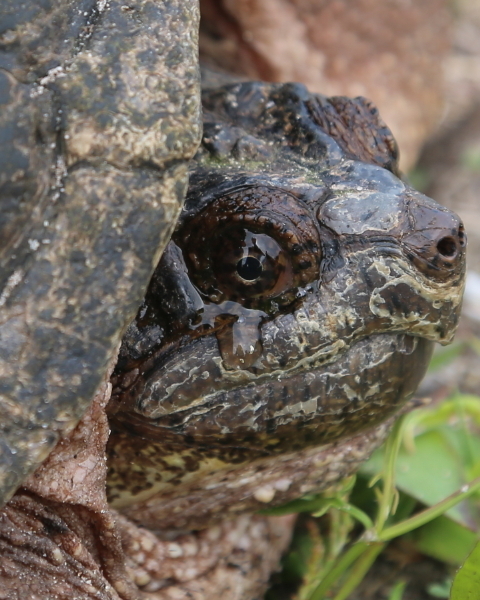 You are currently browsing the Turtle Journal blog archives for May, 2015.